64KB (NOT 32KB), shared with everything. 4 8-bit I/O ports to transfer data to/from the SNES. 8x channels of ADPCM compressed sample goodness. The DSP also has special hardware for echo effects, white noise, and pitch modulation. Two 8-bit 8KHz timers + one more 8-bit 64KHz timer, all have 4-bit count-up values. * Only if X bit is set in the undocumented register. Pages 0/1 are known as the "Zero Pages". Accesses to zero page memory can be done with faster (and smaller) cpu instructions (one byte addresses). Which zero page to be operated on can be switched with a processor flag. Page 1 is mainly used for stack space. F1 |  -  |  -  | PC32| PC10|  -  | ST2 | ST1 | ST0 | Control, Write only! PC10: "PORT CLEAR" Writing '1' here will reset input from ports 0 & 1. STx:  Writing '1' here will activate timer X, writing '0' disables the timer. There will probably be some conflict if the snes writes data at the same time the SPC initiates a port clear function. Some emulators don't emulate this, BSNES does though. Writing to the control register will ALWAYS reset active timers. Control is not readable. Writing '1' to any of the timer bits will start / restart the timer, even if it's already active, writing '0' will stop the timer. Even when using bit operations, the other timers will still be affected. Basically there are actually 8-bytes of data passed around. The SNES uses registers 2140 - 2143. The SPC uses registers F4 - F7. Hardware Quirk! When writing in 16-bit values to 2140 / 2141, a noise pulse (or some technical thingy) may write data to 2143 too! Always write to 2140 / 2141 with 8-bit writes if this is undesired. Another Warning! When a read from a port conflicts with a write to the port from the opposing CPU, the data may be garbled. Always re-fetch values that may be affected by this conflict! cmp a, spc_port0        ; if the value in port0 is different, this means the SNES has sent new data. beq cp_exit             ; if its the same, then there are no messages. mov comms_v, spc_port0  ; PORT0 should contain valid data now, since a few cycles have passed. ; if the value is incorrect then the SNES will get caught in an infinite loop. mov comms_v, a          ; save validation <- THE DATA MAY BE GARBLED! ; data might be incorrect! It may hang-up the SNES side. The DSP is accessed through 2 registers. One register points to a DSP register index. The other allows reading from / writing to the DSP register specified. x: Pointer to DSP register. x: Data to be written / data being read. Write address of DSP register to F2. Write desired value to F3. Read the value from F3. ; spc has some mem->mem / mem->imm instructions too. The SPC contains 3 timers that can be used for general purpose. Timers 0,1 count up at 8KHz, Timer 2 has a higher precision of 64KHz. $FA+X |  t  |  t  |  t  |  t  |  t  |  t  |  t  |  t  | Timer-X, Write only! $FD+X |  -  |  -  |  -  |  -  |  c  |  c  |  c  |  c  | Counter-X, Read only! The timers consist of an 8-bit internal counter and a 4-bit up-counter. When the timer is off, the internal counter can be programmed through registers Timer-X registers. When the timer is activated by a '1' bit in the Control register, then the timer starts counting up (at 8KHz/64Khz) until it reaches the amount specified in Timer-X. When this happens the internal counter is reset and Counter-X is incremented. When you read Counter-X, the value in it will be reset to zero. Take care not to let the up-counter overflow! It's only 4-bits wide, and if it overflows the value will be lost. ...Make sure the timer is off. Read FD periodically to check if ticks have passed. ; An example to wait 15ms. All are 8-bit except for the PC (Program Counter), which points at a 16-bit program execution address. The A (Accumulator) register is compatible with most CPU instructions. The X/Y (Index) registers are mostly used for counters/memory addressing. For some instructions, the Y register can be paired with A ("YA") for 16-bit operations. The SP (Stack Pointer) register points to an area of memory in Page1 (0100 - 01FF). Stack operations affect SP, the IPL ROM initializes SP to the top of Page1. The PSW (Program Status Word) register contains various bits that effect operation of the CPU. Negative Flag (N): The MSB of an operation's result is copied to the Negative flag. Overflow Flag (V): I don't think I ever had to use this bit, It tells you if an overflow occured in the previous arithmetic operation. Direct Page Flag (P): This bit controls the direct-page (dp) operations. 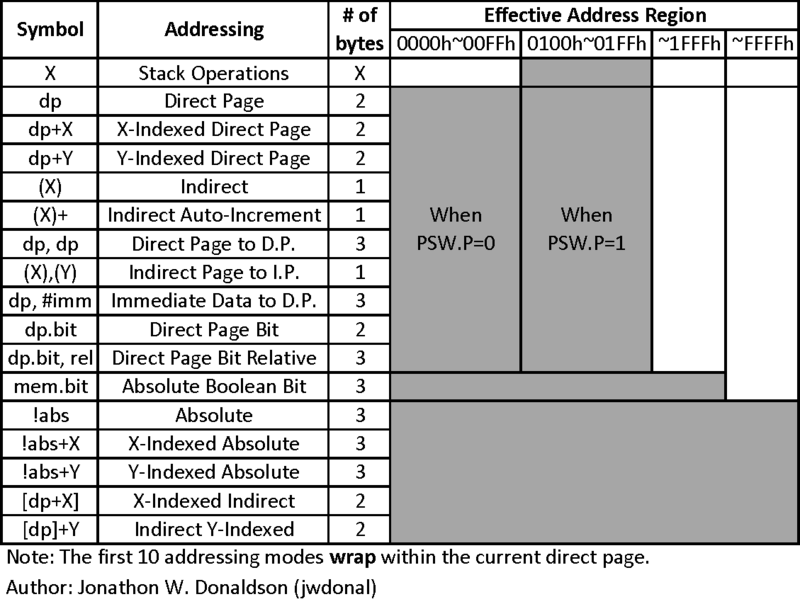 The dp operations only have 1 address byte. If the P flag is cleared then the effective address will be 0000h+address. Otherwise it will be 0100h+address. Half Carry Flag (H): The half-carry flag is used in arithmetic operations. It can be used to determine if the DAA/DAS instruction needs to be executed after a BCD addition/subtraction operation. It cannot be directly set by any instruction, however, it is cleared with CLRV. Carry Flag (C): The carry flag is mainly used in arithmetic operations. It can be used to control program flow after addition/subtraction. Its also used by a few other functions, like shift commands. It can be directly set by instructions SETC and CLRC. Break Flag (B): This flag is unused. The only instruction that touches it is BRK. Interrupt Enable (I): Interrupts are not supported. This flag is unused. SLEEP Halts the processor EF -------- 1 ? STOP Halts the processor FF -------- 1 ? ROL dp 2B 2 4 N-----ZC C << (dp) << C :into A, not the one you just shifted out! MOVW dp, YA DA 2 5 -------- YA -> word:(dp) :same cycles as writing 1 byte! (X), (Y) are direct page addresses too! Assume addition of 100h if the P flag is set. DIV only works if the resulting quotient is < 200h; the output registers contain garbage if the quotient exceeds this. RANGE: This is a shift value for the 4-bit data. FILTER: This selects a filter for the decompression. LOOP: This flag is set if the sample loops (commercial games set this for all blocks in looped samples). END: When the decoder reads this bit, it will stop the sample (or restart from loop point) and set a bit in ENDX. NOTICE! This is only an approximation of the decompression routine performed by the DSP, look at some BRR compression source-code (like DMV47's) for an accurate example! 2. Shift the bits left by RANGE. 3. 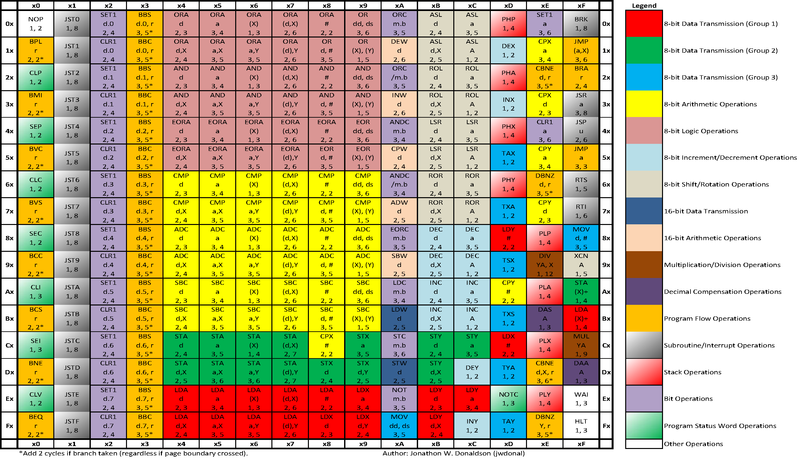 Get filter coefficients a&b from table below. 4. Add `LAST_SAMPLE1 * a` to SAMPLE. 5. Add `LAST_SAMPLE2 * b` to SAMPLE. x0 VOL (L) Left channel volume. x1 VOL (R) Right channel volume. x2 P (L) Lower 8 bits of pitch. x3 P (H) Higher 8-bits of pitch. x5 ADSR (1) If bit7 is set, ADSR is enabled. If cleared GAIN is used. x6 ADSR (2) These two registers control the ADSR envelope. x7 GAIN This register provides function for software envelopes. x9 -OUTX The DSP writes the current waveform value after envelope multiplication and before volume multiplication. 7C -ENDX 1 bit for each voice. 7D EDL Echo delay, 4-bits, higher values require more memory. There are some undocumented quirks (emulated though) that I experienced when using these registers (while writing XMSNES). Sometimes the value I write gets ignored.. (or something), I'm not really sure what the exact problem is. Pitch is a 14-bit value. Let desired DSP pitch be P.
The highest pitch will reproduce the sound at approx. 2 octaves higher (~128KHz sample rate). The lowest pitch is basically not limited (but you will lose accuracy at lower pitches). Source number is a reference to the "Source Directory" (see DIR). The DSP will use the sample with this index from the directory. I'm not sure what happens when you change the SRCN when the channel is active, but it probably doesn't have any effect until KON is set. The ENABL bit determines which envelope mode to use. If this bit is set then ADSR is used, otherwise GAIN is operative. My knowledge about DSP stuff is a bit low. Some enlightenment on how the ADSR works would be greatly appreciated! GAIN can be used to implement custom envelopes in your program. There are 5 modes GAIN uses. Direct: The value of GAIN is set to PARAMETER. Increase (Linear): GAIN slides to 1 with additions of 1/64. Increase (Bent Line): GAIN slides up with additions of 1/64 until it reaches 3/4, then it slides up to 1 with additions of 1/256. Decrease (Linear): GAIN slides down to 0 with subtractions of 1/64. Decrease (Exponential): GAIN slides down exponentially by getting multiplied by 255/256. ENVX gets written to by the DSP. It contains the present ADSR/GAIN envelope value. OUTX is written to by the DSP. It contains the present wave height multiplied by the ADSR/GAIN envelope value. It isn't multiplied by the voice volume though. Main/Echo volume! 8-bit signed values. Regular sound is scaled by the main volume. Echoed sound is scaled by the echo volume. I also had a problem with writing to these registers, sometimes my writes would get ignored, or zeroed? Writing bits to KON will start/restart the voice specified. Writing bits to KOF will cause the voice to fade out. The fade is done with subtraction of 1/256 values and takes about 8msec. It is said that you should not write to KON/KOF in succession, you have to wait a little while (a few NOPs). RESET: Soft reset. Writing a '1' here will set all voices in a state of "Key-On suspension" (???). MUTE is also set. A soft-reset gets triggered upon power-on. MUTE: Mutes all channel output. ECEN: ~Echo enable. A '0' here enables echo data to be written into external memory (the memory your program/data is in!). Be careful when enabling it, it's quite easy to crash your program with the echo hardware! NOISE CLOCK: Designates the frequency for the white noise. This register is written to during DSP activity. Each voice gets 1 bit. If the bit is set then it means the BRR decoder has reached the last compressed block in the sample. Writing to this register sets the Echo Feedback. It's an 8-bit signed value. Some more information on how the feedback works would be nice. So a sine wave in the previous channel would cause some vibrato on the modulated channel. Note that OUTX is before volume multiplication, so you can have a silent channel for modulating. When the noise enable bit is specified for a certain channel, white noise is issued instead of sample data. The frequency of the white noise is set in the FLG register. The white noise still requires a (dummy) sample to determine the length of sound (or unlimited sound if the sample loops). This register enables echo effects for the specified channel(s). This register points to the source(sample) directory in external RAM. The pointer is calculated by Offset*100h. The source directory contains sample start and loop point offsets. 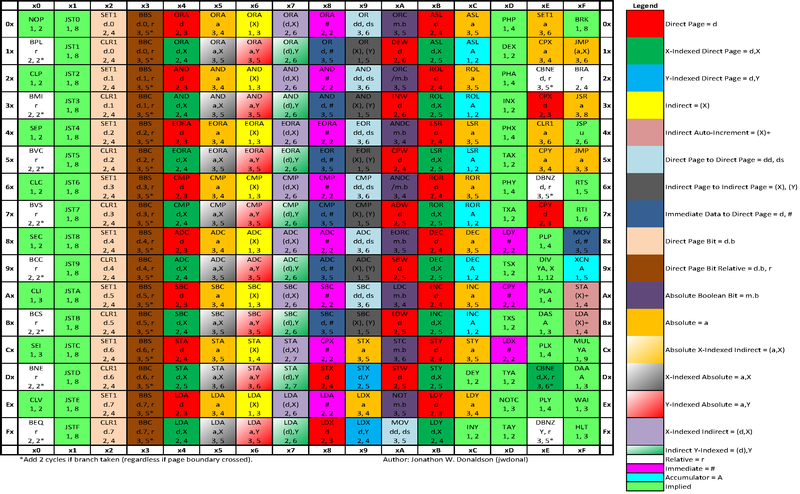 Its a simple array of 16-bit values. This register points to an area of memory to be used by the echo buffer. Like DIR its value is multiplied by 100h. EDL specifies the delay between the main sound and the echoed sound. The delay is calculated as EDL * 16ms. Increased amounts of delay require more memory. The amount of memory required is EDL * 2KBytes (MAX $7800 bytes). The memory region used will be [ESA*100h] -> [ESA*100h + EDL*800h -1]. If EDL is zero, 4 bytes of memory at [ESA*100h] -> [ESA*100h + 3] will still be used. The 8-bytes at $0F,$1F,$2F,$3F,$4F,$5F,$6F,$7F are used by the 8-tap FIR filter. I really have no idea how FIR filters work... but the filter is applied to the echo output. EVOL: This is the volume multiplier of the echo output. Note that even if the Main volume is 0, the echo volume can still be heard. It is independant from the main volume. FLG: Flags register. The "Echo Enable" bit is contained in here. EFB: Echo Feedback. This is an 8-bit signed value used for feedback multiplication. EON: Echo Channel Enable. One bit per channel to indicate that it should be echoed. ESA: Echo Start Address. A pointer to the area of memory designated for the echoing buffer. COEF: Echo FIR Filter Coefficients. Again, I have no idea how the filter works. A setting of 127,0,0,0,0,0,0,0 will result in the original sound. *. Set ESA to memory region to be used. *. Set EDL to desired echo delay. You will require 2KB*EDL of space for the echoing buffer. *. Set the filter coefficients. A setting of 127,0,0,0,0,0,0,0 won't affect the sound output. *. Enable echo for desired channels (EON). 1. Delay 240ms ***see below***. 2. Set EVOL to desired volume. 3. Write '0' to the ECEN bit in the FLG register. 5. Freely change all parameters (except ESA,EDL). *** This is because the echo hardware doesn't actually read the buffer designation values until it reaches the END of the old buffer! (the old buffer sizes could be uninitialized garbage). There is no way to determine the write position. 240ms is the max delay time, so it is the safe value to use. Another method is to read EDL (d) before you set it, and delay d*16ms. Another special note: Echo writing DOES wrap around the memory edge, I had my program crash when the ESA was at the very end of memory (and I didn't delay properly). It wrote to the end... and then wrapped around to munch all my DP memory all the way to the program code. PS: Lower your headphone volume when playing with the EFB register. Don't use an excessive sound data compression ratio. Samples with low sample rates may cause distortion. And they don't convert to BRR very well. Take care that the mixed output doesn't exceed the maximum waveform limit. If the mixed waveform (all 8-channels together) overflows, some distortion noise will be produced. This will mess up your cool 'surreal' effect when your setting one side of the channel volume to negative. Sampled data that isn't continuous will cause 'clicking' sounds to appear. A very obvious example is when you disable a channel by cutting the volume. A quick fade-out should be used instead. ;   "why EF? page1 has 256 memory bytes!" 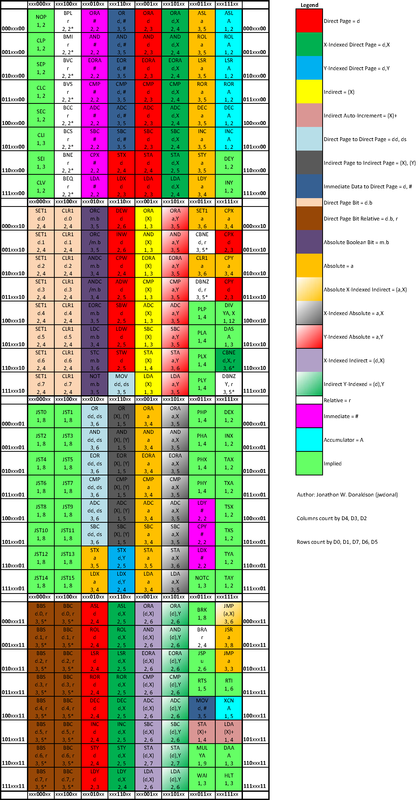 ;   the higher 16 bytes of page0 contain hardware registers. 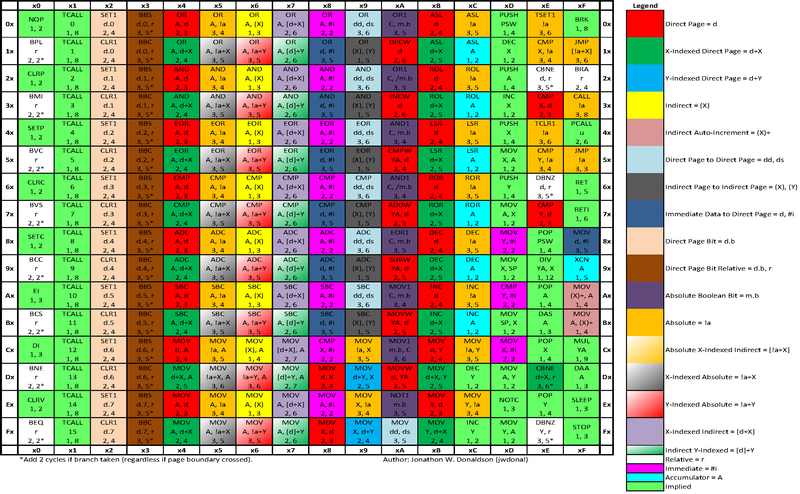 ; is an effective "movw pc, WriteAdr"
; and X/Y index registers are zero, and the SP is initialized to $EF. PORT0=0AAh  >>>                                    | Stage 1, "is the spc ready to receive data??" Warning! If this routine is interrupted, the SPC may time-out! (or something) Your program will then get stuck in an infinite loop of waiting for the SPC reply. Inhibit interrupts during the transfer protocol. cpx #snakd_size ; all bytes transferred? Write a nonzero value in port1 and the transfer address in ports 2/3. Wait for the SPC to mimic the data it receives in port0 (0CCh in this case). The loader only uses port0 for replies. Start a counter at 00h, write the first byte of data to port1, and write the counter to port0. Wait for the SPC to reply with 00h (yes, it mimics). Write the next data byte to port1, increment the counter, write the counter to port0. Wait for the SPC to reply with the counter value. Goto 7 if there are more bytes to be transferred. Write 0 to port1, the program entry point to port2/3, and then finally... add 2 (or more) to the counter and write to port0. Based on SPCTECH by eKid (EFNet - #snesdev) and Anomie's docs.